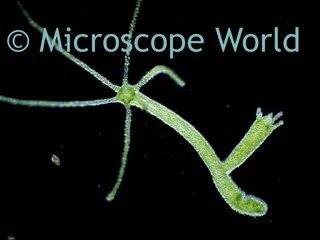 This image is of hydra, budding for reproduction. The image was captured using a Nikon camera adapter courtesy of Mark Simmons. Hydras are predatory animals belonging to the phylum Cnidaria and the class Hydrozoa. Hydra can be found in unpolluted fresh water ponds, lakes or streams. They are generally a few millimeters in length and are best viewed under a high power microscope. Biologists are often interested in the hydra's regenerative ability and because they appear to age very slowly.